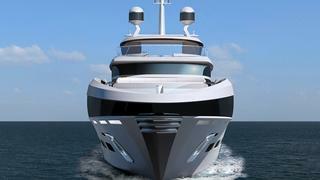 Benetti has collaborated with automotive designer Henrik Fisker on a concept for a 50 metre superyacht. The Benetti Fisker 50 was designed in California with the idea of building the yacht in the yard’s facility in Livorno using an existing Benetti platform. We look at the most interesting features of the Benetti Fisker 50 concept. 1. An imposing front view The front view of the Benetti Fisker 50 concept (above) has been labelled radical, imposing and powerful thanks to the unique use of stainless steel bars on the bow. Above this sits the captain’s window, which stands out with its white dynamic line. 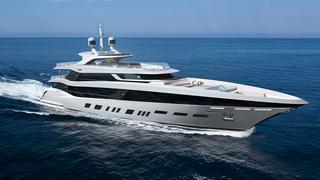 Benetti has collaborated with automotive designer Henrik Fisker on a concept for a 50 metre superyacht. The Benetti Fisker 50 was designed in California with the idea of building the yacht in the yard’s facility in Livorno using an existing Benetti platform. We look at the most interesting features of the Benetti Fisker 50 concept. The front view of the Benetti Fisker 50 concept (above) has been labelled radical, imposing and powerful thanks to the unique use of stainless steel bars on the bow. Above this sits the captain’s window, which stands out with its white dynamic line. 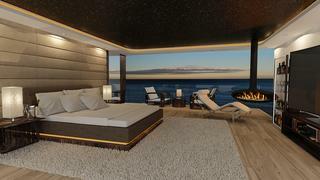 The master suite on the Benetti Fisker 50 concept looks inviting and snug, with its fireplace, royal bed and starlight ceiling. It features a retractable fold down ocean-view terrace and his and hers walk-in wardrobes. 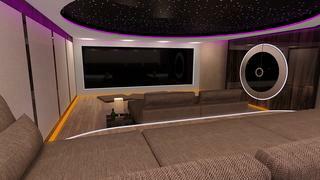 The cinema on the Benetti Fisker 50 concept has a giant screen and reclining beds that accommodate 12. When not in use, half of this cinema can be converted into a gym by sliding back the middle beds and removing the chairs. 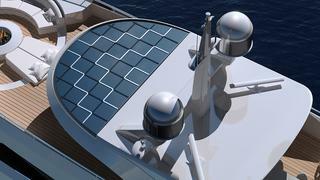 The exterior of the Benetti Fisker 50 concept makes use of integrated solar panels to capture energy. This is used to power ambient lights mounted on her carbon fibre wings to provide light at night. The Benetti Fisker 50 has a few other eco design solutions: the yacht is designed with optional hybrid power, her interior uses advanced and sustainable materials, and power management is used throughout the yacht. The exterior of the Benetti Fisker 50 concept makes use of integrated solar panels to capture energy. This is used to power ambient lights mounted on her carbon fibre wings to provide light at night. The Benetti Fisker 50 has a few other eco design solutions: the yacht is designed with optional hybrid power, her interior uses advanced and sustainable materials, and power management is used throughout the yacht.